Bogdan Sofei, violin, Ingrid Nicola, violin, Andreea Banciu, viola, Adrian Mantu, cello. Simon Aspell, viola, Christopher Marwood, cello. 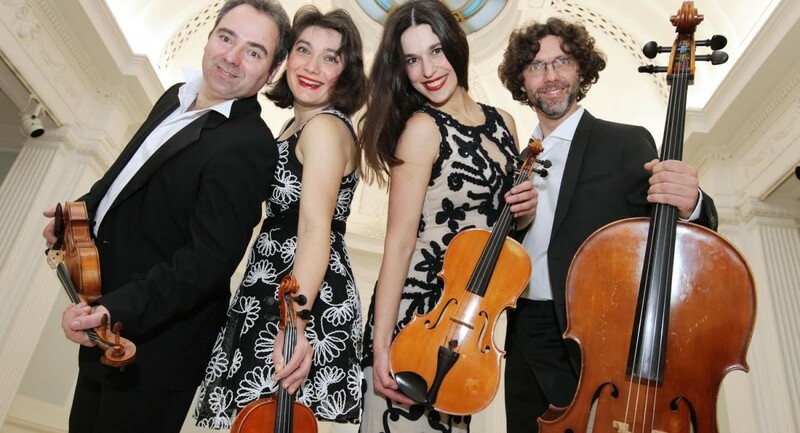 Formed in Bucharest in 1995, Galway’s Ensemble in Residence since 2003 and RTE’s Resident Quartet since 2013, the multiple award-winning ConTempo Quartet is Ireland’s longest established string quartet. They combine performance of the classical quartet repertoire with a strong commitment to Ireland’s composers. Haydn’s glorious, uplifting ‘Sunrise’ Quartet is contrasted in this programme with Cork composer Linda Buckley’s moving tribute to the great Hungarian composer Bela Bartok. The ConTempo are joined by former members of the Vanbrugh Quartet, Simon Aspell and Christopher Marwood, for Brahms’ magical G major sextet. The event is made possible with the support of the Arts Council and Cork County Council.